In stock -This product will ship today if ordered within the next 4 hours and 22 minutes. 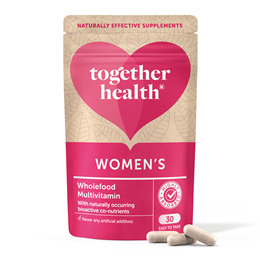 Specially developed for the unique needs of women, Together has taken all the goodness from some of nature’s finest offerings and made this WholeVit Women’s Multi using whole foods. Our bodies better absorb vitamins and minerals when they’re in a whole food form. This way they`re also gentle on the stomach. All of Together’s WholeVit ingredients are raw and complete. Using carefully controlled low-heat conditions, they preserve all the naturally-occurring goodness you find in fresh foods, like live enzymes and phytonutrients, amino acids, trace minerals and other bioactive co-factors. Yeast concentrate* providing: Iron, Selenium, Zinc, Copper, GTF Chromium, Boron, Iodine, Niacin, Pantothenic Acid, Riboflavin, Vitamin B6, Thiamin, Vitamin B12, Vitamin D3 and Manganese, Lithothamnion Calcareum seaweed providing Magnesium; Vitamin C incorporated in citrus pulp; Beta Carotene incorporated in carrot concentrate; Vitamin E combined in vegetable oil, Biotin incorporated in corn meal, Folic Acid** and Vitamin K2 incorporated in alfalfa concentrate, Vegicap (Vegetable cellulose). *An inactive and non-candida yeast, no known allergic reactions. **As Folate. Take one vegicap daily as a food supplement with or without food. 100% plant based vegicap may be split and powder mixed with food or drink. Do not exceed the recommended intake unless directed by a practitioner. 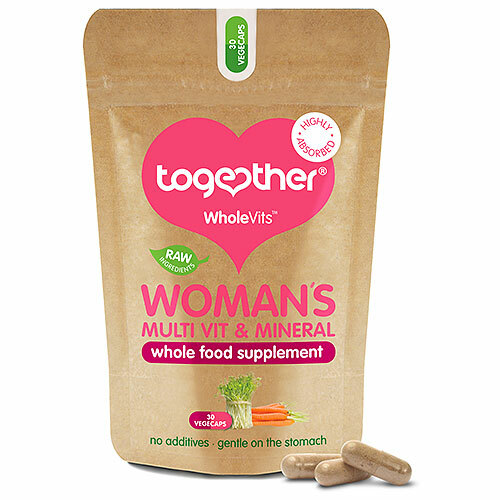 Below are reviews of Together WholeVit Women`s Multivitamin - 30 Vegicaps by bodykind customers. If you have tried this product we'd love to hear what you think so please leave a review. Finally vitamins from food! So happy to have found these at bodykind, it's not made sense to me that I haven't been able to get vitamins made from food before! I'm also glad the manufacturers decided to use capsules so easy to swallow. Very gentle on the stomach. I really like the pouch great for travelling. Will definitely be ordering these again and highly recommend them. Specially developed for the unique needs of women, Together has taken all the goodness from some of nature’s finest offerings and made this WholeVit Women’s Multi using whole foods.